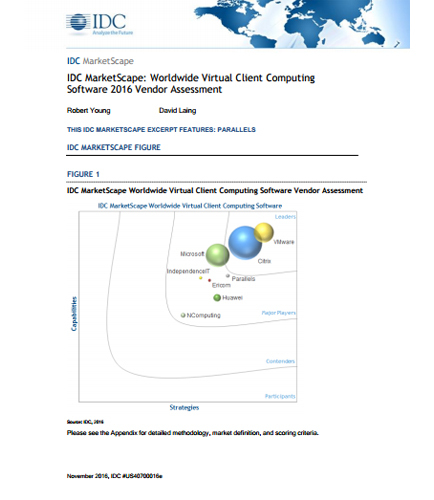 "Worldwide Virtual Client Computing Software 2016 Vendor Assessment"
Virtual Client Computing technology plays a key role in the unified device management, which can enable an IT organization to focus more of its energy into strategic digital transformation (DX) endeavors as opposed to being consumed by managing PCs, users, applications, and devices. In future, IT buyers looking into virtual client computing (VCC) software suppliers not only have to consider their company's current needs but also what they will need to accomplish DX. Does the VCC solution integrate well with other IT/datacenter management tools? Virtualization, in computing, refers to creating a virtual vision rather than an actual vision of something, which includes computer network resources, virtual computer, storage devices, and hardware platform and so on. A technology in which an application, data storage, or operating system is abstracted away from the original underlying hardware or software is called virtualization. Virtualization uses a software layer namely hypervisor to emulate the hardware. Software is a general term for the various kinds of programs that enable computers and related devices to work. Software consists of carefully-organized computer instructions and code written by programmers in any computer languages such as Java, PHP, C, C+ and Python.